We will be in room 0790. The room is on the ground floor. The easiest way to reach this room is via the side entrance at the corner Theresienstraße/Arcisstraße. 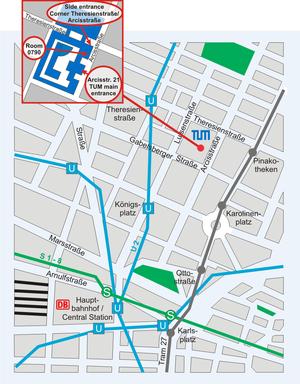 The bus departs every 20 minutes from Terminal 2, Terminal 1 Modul A, Terminal 1 Modul D and München Airport Center (MAC). The travel time is approx. 40 minutes. This page was last modified on 19 September 2017, at 11:10.